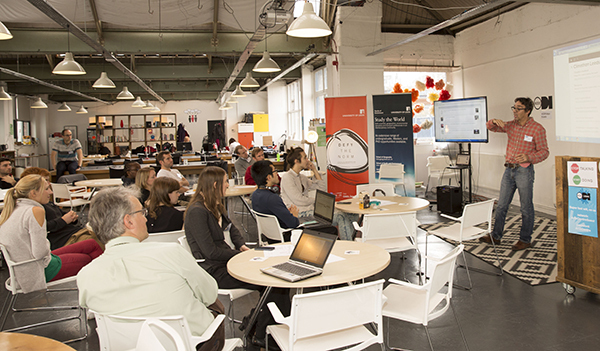 [LEEDS, 01.11.2016] – Participants at an event in Leeds came up with new solutions to reduce carbon emissions as part of a 24-hour global challenge to solve climate change. 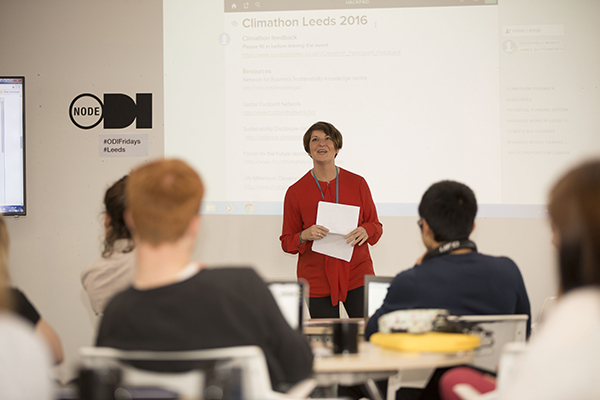 Students and stakeholders in Leeds joined citizens in world cities such as Paris and Shanghai simultaneously taking part in the hackathon-style Climathon event. The Climate-KIC Climathon brought together major cities across six continents to solve city-wide climate challenges. In Leeds, 28 participants took part from 12 noon on 28 October until noon the following day and focused on an energy efficiency challenge set by Leeds City Council. It is was organised by the Priestley International Centre for Climate and partners from the University of Leeds at ODI (the Leeds node of the Open Data Institute). After working through the night, four teams stayed the course to present their ideas to the judging panel of Piers Forster, Director of the Priestley International Centre for Climate, Tom Knowland, Head of Sustainable Energy and Climate Change at Leeds City Council and Mark Taylor from the University’s student start-up service, SPARK. The winning team, “Project Revolver”, developed a solution to retrofit current housing stock in Leeds, financed through a revolving fund and repaid under a “Council tax premium adjustment”. The event was introduced by Councillor Lucinda Yeadon, Deputy Leader of Leeds City Council and Executive Member for Environment and Sustainability. Council officer Tom Knowland, who set out the problem Leeds City Council faces with trying to reduce carbon emissions from its domestic housing sector following the collapse of the Green Deal, was enthusiastic about the winning team’s solution. The challenge: How can we deliver domestic carbon reduction in an age of austerity? The challenge was for participants to come up with alternative ways of approaching and financing energy efficiency measures in the housing sector. Following the removal of policies to boost uptake, innovative new business models are needed to ensure energy efficiency fulfils its potential to create carbon savings and cost savings for the city of Leeds. A third of Leeds’ carbon emissions are due to domestic energy consumption, which contributes substantially to GDP loss to the city. Although Leeds City Council has been successful in attracting funding for efficiency measures in the past, recent national policy changes mean these are no longer cost effective. The council was keen to examine the potential of a revolving fund, which captures and reinvests savings, as well as new initiatives to maximise householder participation and novel solutions for improving energy efficiency, especially in the private rented sector. The winning idea was chosen because it was the best fit with the brief and took a pragmatic but creative approach to funding energy efficiency. Project Revolver’s solution adopted a “city endowment” fundraising approach, reducing new capital investment needed by half while achieving required £1.3 billion overall investment, saving 13 Mt carbon dioxide by 2050. The model builds on the concept of a revolving fund for accelerating the implementation of measures that reduce the energy use and carbon footprint of the Leeds housing stock, originally developed by Professor Andy Gouldson and his team at the University of Leeds. Initial capital would be developed through a number of funding sources, including an endowment fund, inspired by examples from higher education. The funds would be allocated through a Local Green Investment Bank to projects in the Leeds City Region. Participating homes would have a premium added to their council tax – equivalent to less than the total energy saving the household is estimated to benefit from – meaning the occupants face no negative financial implications and have warmer homes. The council tax premium is then passed on by the local council to the local green investment bank, which will then reinvest the funds in further retrofitting. A further benefit would be that at the end of the 20-year period of the scheme the city would be left with an endowment offering a perpetual source of money for community and environmental initiatives in the city. All four teams came up with innovative ideas for addressing the issue, including using non-invasive smart metering of appliances to control household energy usage, linking energy consumption with peaks in renewable energy output and a green savings account, the deposits of which would be invested in improving the energy efficiency of rented homes, producing a win-win for tenants, landlords and small investors. The Priestley International Centre for Climate partnered with Leeds City Council and the following University of Leeds research institutes and groups: Centre for Climate Change Economics and Policy (CCCEP); CITIES theme; Centre for Industrial Energy, Materials and Products (CIE-MAP); Sustainability Research Institute (SRI); Centre for Enterprise and Entrepreneurship Studies (CEES) and Spark. Energiser sessions were provided by Everyday Juice Ltd and the venue was ODI Leeds. 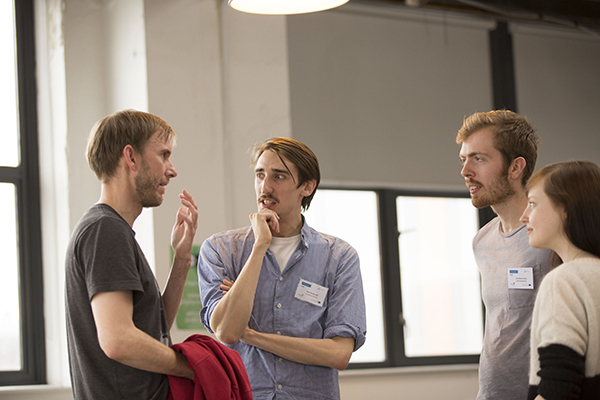 Climate-KIC first organised the Climathon in 2015, in the run up to the Paris climate change summit. Climate-KIC organises the Climathon to help kick-start new climate change solutions, and to inspire and empower the next generation of climate leaders. Climathon is a global 24-hour climate change event which took place simultaneously in major cities around the world on 28 October 2016. Climate-KIC’s Climathon brings together the challenges of the world’s cities with the people who have the passion and ability to solve them. Participants gathered for 24 hours to engage in a climate-related problem solving workshop. City citizens around the world get to take direct climate action in their own cities by coming up with innovative solutions to local climate change problems. Climate-KIC is the EU’s largest public private partnership addressing climate change through innovation to build a zero carbon economy. We address climate change across four priority themes: urban areas, land use, production systems, and decision metrics and finance. Education is at the heart of these themes to inspire and empower the next generation of climate leaders. Climate-KIC is supported by the European Institute of Innovation and Technology (EIT), a body of the European Union. The Centre for Climate Change Economics and Policy (CCCEP) brings together some of the world’s leading researchers on climate change economics and policy with a mission to advance public and private action on climate change through rigorous, innovative research. The Centre is hosted jointly by the University of Leeds and the London School of Economics (LSE) and is chaired by Professor Lord Stern of Brentford. It is funded by the Economic and Social Research Council. The Priestley International Centre for Climate at the University of Leeds brings together world leading expertise in all the key strands of climate change research. As well as forging new international partnerships, the Priestley Centre’s focus is on interdisciplinary research partnerships that better link our physical, technological, economic and social understanding of climate change with strategies for mitigation and adaptation. 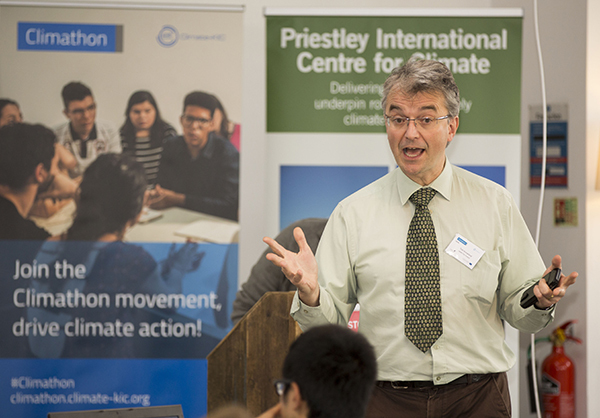 The Priestley International Centre for Climate is one of the University’s flagship strategic investments in response to the global challenge of climate change, with £6.82m invested in it over five years. The director is Piers Forster, Professor of Physical Climate Change in the School of Earth and Environment.